There’s something naggingly familiar about the opening title sequence of Project Blue Book. The screen is filled with grainy old black-and-white newspaper photographs of flying saucers, 1950s supersonic jets, mushroom clouds and a couple, their eyes obscured by black strips, standing beside their car in a field somewhere in rural America. There are flashes of documents (more black strips here, indicating redacted text), strange symbols and drawings of alien beings with the classic bug eyes and bulbous heads familiar from a hundred B-movies and a thousand pulp magazine covers. There are dramatic newspaper headlines. “MYSTERIOUS LIGHTS IN SKY!” reads one, while another, superimposed over an old graphic of three smiling, long-legged women in shorts riding on a rocket across the Moscow night sky, says: “RUSSIA HAS ATOMIC BOMB!” Throw in some ominous, slightly otherworldly music and it’s all very reminiscent of the famous opening of The X-Files. In fact, if you were to take The X-Files and shove it into a blender with The Americans and Taken — that’s the epic 2002 mini-series about alien abductions, by the way, not the dumb Liam Neeson action movie franchise — you’d probably end up with something that looks an awful lot like Project Blue Book, SyFy’s new Wednesday night series starring Drumcondra’s finest, Aidan Gillen, as American astrophysicist and Ufologist Professor J Allen Hynek. Project Blue Book shares some elements with all three series (the UFO theme and the sense of Cold War paranoia that runs through it), but what sets it apart from them is the fact that it has one foot in history, even if it’s not always entirely faithful to reality. There really was a J Allen Hynek (he died in 1986, aged 75) and there really was a Project Blue Book. It was the lengthiest and most famous of three studies of unidentified flying objects conducted by the United States Air Force. In reality as in the series, Hynek, who came up with the ‘Close Encounter’ classification system used in Steven Spielberg’s classic film, was recruited by the USAF to conduct scientific analysis of UFO reports, which included looking for trace evidence left by the alleged alien visitors. Hynek started out as a sceptic. But by the time the project wound down in 1969, after 16 years and more than 12,000 case files, he’d had a change of mind and in later life was sometimes in open conflict with the USAF’s stance on some of the findings. 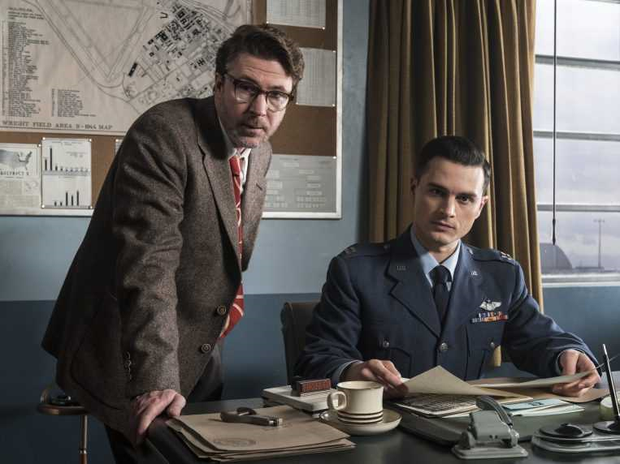 Every episode of Project Blue Book (tomorrow night’s is the second) tells us that it’s “based on true events”, but that some dramatic licence has been taken. For that, we can probably read “quite a lot of dramatic licence”. The first departure from the truth is Hynek’s partner, cocky Air Force pilot Captain Michael Quinn (Michael Malarkey), who’s an entirely fictional character. If not quite the Scully to Hynek’s Mulder, Quinn at least represents the official Air Force policy, which is to disprove the existence of little green men in flying saucers. The spin the series puts on this, naturally, is that if Hynek should find some undeniable proof of alien life, then Quinn should cover it up. Frankly, a series about a UFO investigator in which the top military brass aren’t engaged in a massive lie and hiding a hangar-load of alien artefacts somewhere in the desert wouldn’t be a whole lot of fun, and probably wouldn’t last very long either. So Project Blue Book throws in a pair of duplicitous USAF generals (Neal McDonough and Michael Harney), a blonde Russian spy (Ksenia Solo) who befriends Hynek’s nice suburban wife (Laura Mennell) in order to plant bugs in her house, sinister men in hats, and a shadowy figure who leads Hynek to an abandoned amusement park containing apparent clues to alien existence. It’s great, pulpy fun and it’s all dressed up with gorgeously stylish 1950s trappings. Project Blue Book is on SyFy on Wednesday at 9pm.